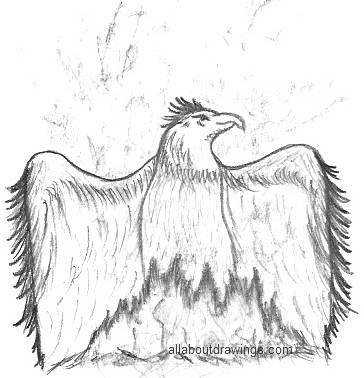 These drawings of the phoenix bird are created by using the information I found via research. My phoenix drawings illustrate the perception of how the bird looks because I don't think anyone has actually sighted this bird. 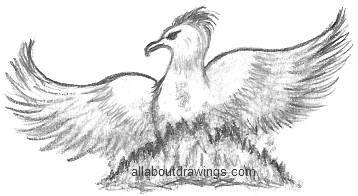 This outline of a phoenix bird drawing shows the bird fanning the fire. 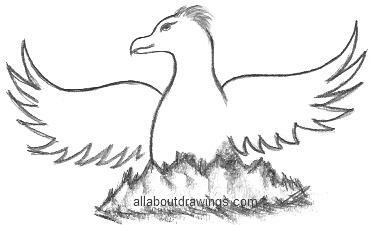 The drawing will make more sense when you read the story below which tells you about this mythical bird and how it came to be. The myth of the phoenix bird originated in Egyptian Mythology: "The bird that rises from beneath the ashes". This is the story as I understand it. Apparently, this bird is the only one of its kind in existence for a period of 500 years or so. It builds a nest with sticks and spices at the end of its life and the nest is constructed in such a way that it is set alight by the sun. The phoenix fans the fire with its wings to assist the burning process. A new phoenix bird is born out of the ashes and the remains of the burned bird. For this reason, you have probably heard of phoenix being referred to as a sign of immortality. The fire is necessary to ensure the continuing cycle of the species. Just as fire destroys a forest or scrub today, new trees and vegetation will grow in its place. When the young phoenix gets strong enough, he carries the nest containing his father's ashes to lay it at the altar in the temple for the Sun-God. What Color Is The Phoenix Bird? The color of the bird varies in all the stories that I have read. Purple and red are mentioned consistently with some gold feathers around the neck. The body is said to be purple so maybe the crest on its head has red feathers. In these drawings of the phoenix bird, I designed the bird the way I imagined it would look. I also used other pictures that I had seen to get some ideas. It sure wasn't easy to find drawings or pictures of a mythical creature. I always thought the phoenix bird would be similar to an eagle in appearance and that resemblance was confirmed in some of the books I found on this topic. A colored phoenix bird drawing would be a spectacular sight given the colors it is said to have. Knowledge about the origin of the phoenix bird helps you to design and create how you perceive the bird. It seems to me this myth was born especially for artists so we can allow our imaginations to flow freely. Anyway, due to the mystery surrounding the Phoenix Bird, you can certainly have a fair bit of fun creating your own version!